Today’s blog post on multi-label classification with Keras was inspired from an email I received last week from PyImageSearch reader, Switaj. Hi Adrian, thanks for the PyImageSearch blog and sharing your knowledge each week. I’m building an image fashion search engine and need help. 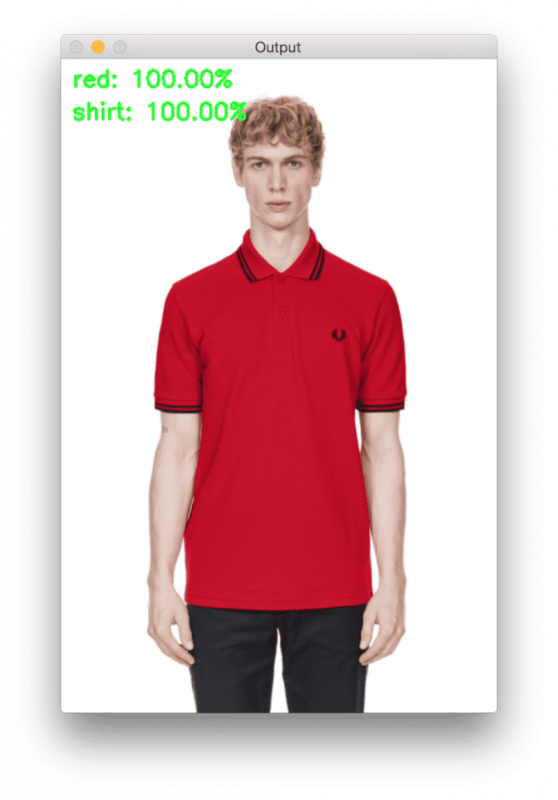 Using my app a user will upload a photo of clothing they like (ex. shirt, dress, pants, shoes) and my system will return similar items and include links for them to purchase the clothes online. Clothing type: Shirts, dresses, pants, shoes, etc. Color: Red, blue, green, black, etc. Texture/appearance: Cotton, wool, silk, tweed, etc. I’ve trained three separate CNNs for each of the three categories and they work really well. Is there a way to combine the three CNNs into a single network? Or at least train a single network to complete all three classification tasks? I don’t want to have to apply them individually in a cascade of if/else code that uses a different network depending on the output of a previous classification. Is it possible for a Keras deep neural network to return multiple predictions? And if so, how is it done? To learn how to perform multi-label classification with Keras, just keep reading. Today’s blog post on multi-label classification is broken into four parts. In the first part, I’ll discuss our multi-label classification dataset (and how you can build your own quickly). From there we’ll briefly discuss SmallerVGGNet , the Keras neural network architecture we’ll be implementing and using for multi-label classification. We’ll then take our implementation of SmallerVGGNet and train it using our multi-label classification dataset. Finally, we’ll wrap up today’s blog post by testing our network on example images and discuss when multi-label classification is appropriate, including a few caveats you need to look out for. Figure 1: A montage of a multi-class deep learning dataset. We’ll be using Keras to train a multi-label classifier to predict both the color and the type of clothing. The dataset we’ll be using in today’s Keras multi-label classification tutorial is meant to mimic Switaj’s question at the top of this post (although slightly simplified for the sake of the blog post). The goal of our Convolutional Neural network will be to predict both color and clothing type. I created this dataset by following my previous tutorial on How to (quickly) build a deep learning image dataset. The entire process of downloading the images and manually removing irrelevant images for each of the six classes took approximately 30 minutes. When trying to build your own deep learning image datasets, make sure you follow the tutorial linked above — it will give you a huge jumpstart on building your own datasets. In the root of the zip, you’re presented with 6 files and 3 directories. search_bing_api.py : This script enables us to quickly build our deep learning image dataset. You do not need to run this script as the dataset of images has been included in the zip archive. I’m simply including this script as a matter of completeness. train.py : Once we’ve acquired the data, we’ll use the train.py script to train our classifier. fashion.model : Our train.py script will serialize our Keras model to disk. We will use this model later in the classify.py script. mlb.pickle : A scikit-learn MultiLabelBinarizer pickle file created by train.py — this file holds our class names in a convenient serialized data structure. plot.png : The training script will generate a plot.png image file. If you’re training on your own dataset, you’ll want to check this file for accuracy/loss and overfitting. classify.py : In order to test our classifier, I’ve written classify.py . You should always test your classifier locally before deploying the model elsewhere (such as to an iPhone deep learning app or to a Raspberry Pi deep learning project). dataset : This directory holds our dataset of images. Each class class has its own respective subdirectory. We do this to (1) keep our dataset organized and (2) make it easy to extract the class label name from a given image path. pyimagesearch : This is our module containing our Keras neural network. Because this is a module, it contains a properly formatted __init__.py . The other file, smallervggnet.py contains the code to assemble the neural network itself. examples : Seven example images are present in this directory. We’ll use classify.py to perform multi-label classification with Keras on each of the example images. If this seems a lot, don’t worry! We’ll be reviewing the files in the approximate order in which I’ve presented them. Figure 2: A VGGNet-like network that I’ve dubbed “SmallerVGGNet” will be used for training a multi-label deep learning classifier with Keras. The CNN architecture we are using for this tutorial is SmallerVGGNet , a simplified version of it’s big brother, VGGNet . The VGGNet model was first introduced by Simonyan and Zisserman in their 2014 paper, Very Deep Convolutional Networks for Large Scale Image Recognition. As a matter of completeness we are going to implement SmallerVGGNet in this guide; however, I’m going to defer any lengthy explanation of the architecture/code to my previous post — please refer to it if you have any questions on the architecture or are simply looking for more detail. If you’re looking to design your own models, you’ll want to pick up a copy of my book, Deep Learning for Computer Vision with Python. Our class is defined on Line 12. We then define the build function on Line 14, responsible for assembling the convolutional neural network. The build method requires four parameters — width , height , depth , and classes . The depth specifies the number of channels in an input image, and classes is the number (integer) of categories/classes (not the class labels themselves). We’ll use these parameters in our training script to instantiate the model with a 96 x 96 x 3 input volume. The optional argument, finalAct (with a default value of "softmax" ) will be utilized at the end of the network architecture. Changing this value from softmax to sigmoid will enable us to perform multi-label classification with Keras. Keep in mind that this behavior is different than our original implementation of SmallerVGGNet in our previous post — we are adding it here so we can control whether we are performing simple classification or multi-class classification. From there, we enter the body of build , initializing the model (Line 17) and defaulting to "channels_last" architecture on Lines 18 and 19 (with a convenient switch for backends that support "channels_first" architecture on Lines 23-25). Our CONV layer has 32 filters with a 3 x 3 kernel and RELU activation (Rectified Linear Unit). We apply batch normalization, max pooling, and 25% dropout. Dropout is the process of randomly disconnecting nodes from the current layer to the next layer. This process of random disconnects naturally helps the network to reduce overfitting as no one single node in the layer will be responsible for predicting a certain class, object, edge, or corner. Notice the changes in filters, kernels, and pool sizes in this code block which work together to progressively reduce the spatial size but increase depth. Fully connected layers are placed at the end of the network (specified by Dense on Lines 57 and 64). Line 65 is important for our multi-label classification — finalAct dictates whether we’ll use "softmax" activation for single-label classification or "sigmoid" activation in the case of today’s multi-label classification. Refer to Line 14 of this script, smallervgggnet.py and Line 95 of train.py . Now that we have implemented SmallerVGGNet , let’s create train.py , the script we will use to train our Keras network for multi-label classification. I urge you to review the previous post upon which today’s train.py script is based. In fact, you may want to view them on your screen side-by-side to see the difference and read full explanations. Today’s review will be succinct in comparison. On Lines 2-19 we import the packages and modules required for this script. Line 3 specifies a matplotlib backend so that we can save our plot figure in the background. I’ll be making the assumption that you have Keras, scikit-learn, matpolotlib, imutils and OpenCV installed at this point. Command line arguments to a script are like parameters to a function — if you don’t understand this analogy then you need to read up on command line arguments. --dataset : The path to our dataset. --model : The path to our output serialized Keras model. --labelbin : The path to our output multi-label binarizer object. --plot : The path to our output plot of training loss and accuracy. Be sure to refer to the previous post as needed for explanations of these arguments. Our network will train for 75 EPOCHS in order to learn patterns by incremental improvements via backpropagation. We’re establishing an initial learning rate of 1e-3 (the default value for the Adam optimizer). The batch size is 32 . You should adjust this value depending on your GPU capability if you’re using a GPU but I found a batch size of 32 works well for this project. As stated above, our images are 96 x 96 and contain 3 channels. Additional detail is provided in the previous post. Here we are grabbing the imagePaths and shuffling them randomly, followed by initializing data and labels lists. Next, we’re going to loop over the imagePaths , preprocess the image data, and extract multi-class-labels. First, we load each image into memory (Line 53). Then, we perform preprocessing (an important step of the deep learning pipeline) on Lines 54 and 55. We append the image to data (Line 56). As you can see, the labels list is a “list of lists” — each element of labels is a 2-element list. The two labels for each list is constructed based on the file path of the input image. Our data list contains images stored as NumPy arrays. In a single line of code, we convert the list to a NumPy array and scale the pixel intensities to the range [0, 1] . We also convert labels to a NumPy array as well. In order to binarize our labels for multi-class classification, we need to utilize the scikit-learn library’s MultiLabelBinarizer class. You cannot use the standard LabelBinarizer class for multi-class classification. Lines 72 and 73 fit and transform our human-readable labels into a vector that encodes which class(es) are present in the image. One-hot encoding transforms categorical labels from a single integer to a vector. The same concept applies to Lines 16 and 17 except this is a case of two-hot encoding. Notice how on Line 17 of the Python shell (not to be confused with the code blocks for train.py ) two categorical labels are “hot” (represented by a “1” in the array), indicating the presence of each label. 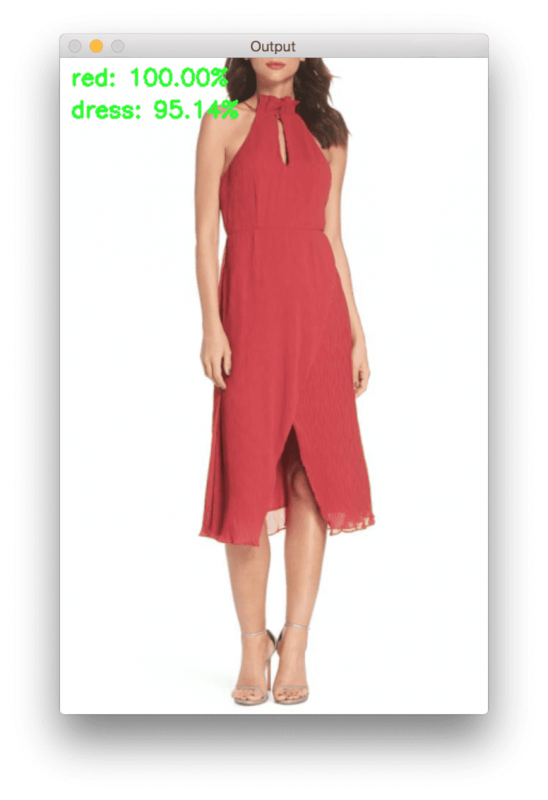 In this case “dress” and “red” are hot in the array (Lines 14-17). All other labels have a value of “0”. Splitting the data for training and testing is common in machine learning practice — I’ve allocated 80% of the images for training data and 20% for testing data. This is handled by scikit-learn on Lines 81 and 82. Our data augmenter object is initialized on Lines 85-87. Data augmentation is a best practice and a most-likely a “must” if you are working with less than 1,000 images per class. On Lines 92-95 we build our SmallerVGGNet model, noting the finalAct="sigmoid" parameter indicating that we’ll be performing multi-label classification. On Lines 105 and 106 we compile the model using binary cross-entropy rather than categorical cross-entropy. This may seem counterintuitive for multi-label classification; however, the goal is to treat each output label as an independent Bernoulli distribution and we want to penalize each output node independently. From there we launch the training process with our data augmentation generator (Lines 110-114). Accuracy + loss for training and validation is plotted on Lines 127-137. The plot is saved as an image file on Line 138. In my opinion, the training plot is just as important as the model itself. I typically go through a few iterations of training and viewing the plot before I’m satisfied to share with you on the blog. I like to save plots to disk during this iterative process for a couple reasons: (1) I’m on a headless server and don’t want to rely on X-forwarding, and (2) I don’t want to forget to save the plot (even if I am using X-forwarding or if I’m on a machine with a graphical desktop). Recall that we changed the matplotlib backend on Line 3 of the script up above to facilitate saving to disk. Don’t forget to use the “Downloads” section of this post to download the code, dataset, and pre-trained model (just in case you don’t want to train the model yourself). Figure 3: Our Keras deep learning multi-label classification accuracy/loss graph on the training and validation data. Now that our multi-label classification Keras model is trained, let’s apply it to images outside of our testing set. This script is quite similar to the classify.py script in my previous post — be sure to look out for the multi-label differences. On Lines 2-9 we import the necessary packages for this script. Notably, we’ll be using Keras and OpenCV in this script. Then we proceed to parse our three required command line arguments on Lines 12-19. We take care to preprocess the image in the same manner as we preprocessed our training data. We load the model and multi-label binarizer from disk into memory on Lines 34 and 35. You can modify this code to return more class labels if you wish. I would also suggest thresholding the probabilities and only returning labels with > N% confidence. The loop on Lines 44-48 draws the top two multi-label predictions and corresponding confidence values on the output image. Similarly, the loop on Lines 51 and 52 prints the all the predictions in the terminal. This is useful for debugging purposes. Finally, we show the output image on the screen (Lines 55 and 56). Let’s put classify.py to work using command line arguments. You do not need to modify the code discussed above in order to pass new images through the CNN. Simply use the command line arguments in your terminal as is shown below. 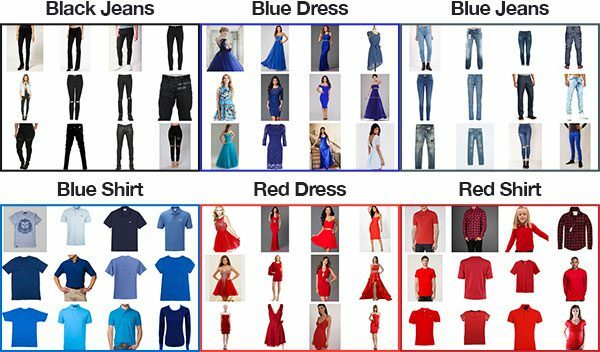 Figure 4: The image of a red dress has correctly been classified as “red” and “dress” by our Keras multi-label classification deep learning script. Success! Notice how the two classes (“red” and “dress”) are marked with high confidence. Figure 5: The “blue” and “dress” class labels are correctly applied in our second test of our Keras multi-label image classification project. Figure 6: With 100% confidence, our deep learning multi-label classification script has correctly classified this red shirt. The red shirt result is promising. How about a blue shirt? 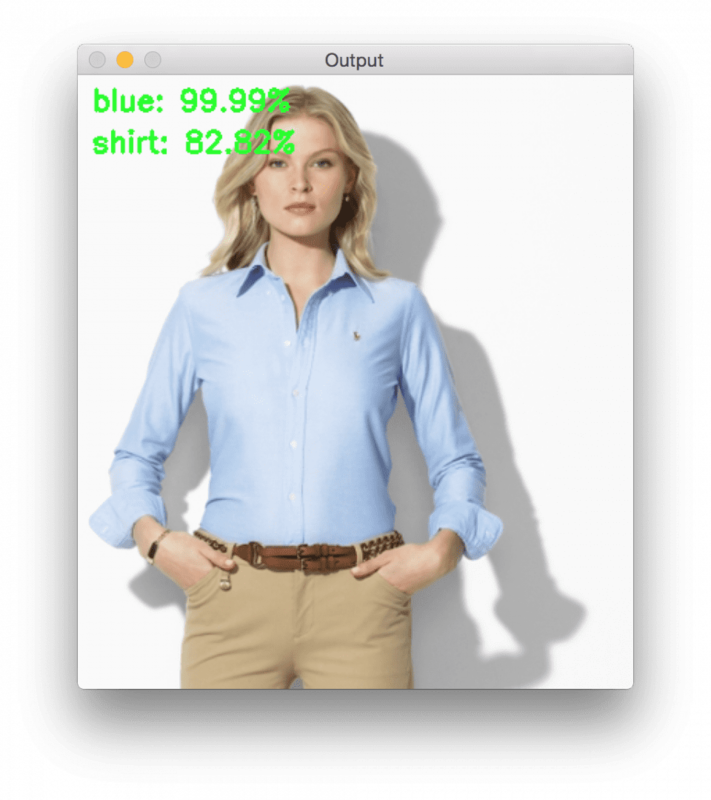 Figure 7: Deep learning + multi-label + Keras classification of a blue shirt is correctly calculated. Our model is very confident that it sees blue, but slightly less confident that it has encountered a shirt. That being said, this is still a correct multi-label classification! 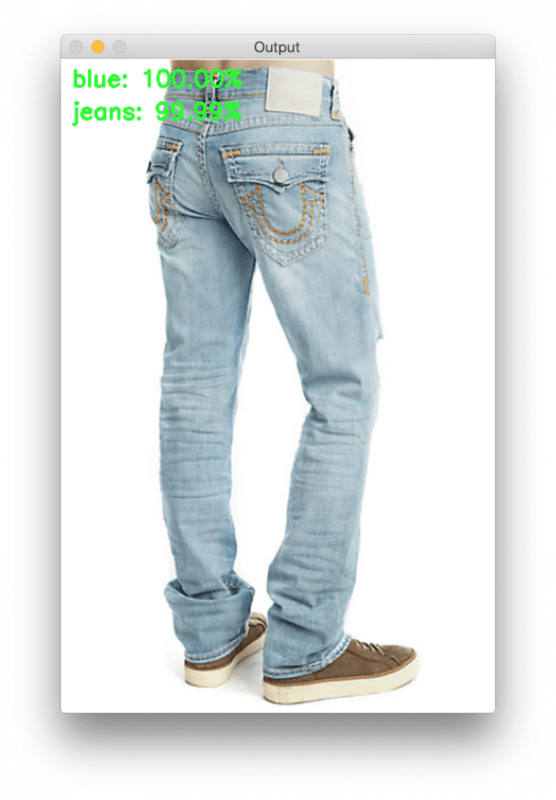 Figure 8: This deep learning multi-label classification result proves that blue jeans can be correctly classified as both “blue” and “jeans”. Figure 9: Both labels, “jeans” and “black” are correct in this Keras multi-label classification deep learning experiment. I can’t be 100% sure that these are denim jeans (they look more like leggings/jeggings to me), but our multi-label classifier is! Let’s try a final example of a black dress ( example_07.jpg ). While our network has learned to predict “black jeans” and “blue jeans” along with both “blue dress” and “red dress”, can it be used to classify a “black dress”? Figure 10: What happened here? Our multi-class labels are incorrect. Color is marked as “black” but the classifier had a higher confidence that this was an image of “jeans” than a “dress”. The reason is that our neural network never saw this combination in its training data. See the “Summary” below for further explanation. Oh no — a blunder! Our classifier is reporting that the model is wearing black jeans when she is actually wearing a black dress. Why are our multi-class predictions incorrect? To find out why, review the summary below. In today’s blog post you learned how to perform multi-label classification with Keras. From there you can train your network as you normally would. The end result of applying the process above is a multi-class classifier. You can use your Keras multi-class classifier to predict multiple labels with just a single forward pass. You need training data for each combination of categories you would like to predict. Just like a neural network cannot predict classes it was never trained on, your neural network cannot predict multiple class labels for combinations it has never seen. The reason for this behavior is due to activations of neurons inside the network. If your network is trained on examples of both (1) black pants and (2) red shirts and now you want to predict “red pants” (where there are no “red pants” images in your dataset), the neurons responsible for detecting “red” and “pants” will fire, but since the network has never seen this combination of data/activations before once they reach the fully-connected layers, your output predictions will very likely be incorrect (i.e., you may encounter “red” or “pants” but very unlikely both). Again, your network cannot correctly make predictions on data it was never trained on (and you shouldn’t expect it to either). Keep this caveat in mind when training your own Keras networks for multi-label classification. To be notified when future posts are published here on PyImageSearch, just enter your email address in the form below! When I am implementing it for getting the prediction of the classes in real time i.e. taking input frames from webcam, the process became very slow. What network are you using? Is it the network detailed in this blog post? And what type of webcam? USB/builtin? IP? Maybe next blog should be how to do the same, but with fine tunning. Example – we like to classify bottles (for that we reuse already trained network – ) and aditionally we like to have color attribute (without cheating with opencv :)). Thanks for sharing, much appreciated. I had the same question and this post addressed it. Once again, amazing tutorial, dude. I implemented something similar to that at work a while ago and it was really, really slow and wonky (first project I did that I did not use a tutorial as inspiration for). Your solution is better by far, I’ve learned a lot from your tutorial and will keep that in mind for the future! Thanks Oliver, I really appreciate that. I certainly had a lot of fun creating this tutorial and I’m really happy I can share it with you. I started out learning machine learning with your tutorials around December last year. I hope that I will one day be as well versed in the subject as you are! We normally pass batches of images through the network. The .predict method will return an array of predictions the size of the batch. Therefore, with only one image, we grab the first (0-th) entry for the returned result. If you are new to deep learning and Keras I would recommend working through Deep Learning for Computer Vision with Python where I cover these fundamental concepts and techniques in detail. Was there maybe a mistake in your post? Thank you! Hey Lorenzo — there was no mistake in the post. I would suggest giving the tutorial another read or two as I think you may be struggling with the difference between multi-class classification and multi-label classification. The post will help clear up the differences for you. The gist is that there is a difference between multi-class classification and multi-label classification. In multi-class classification there are two or more class labels in our dataset. Our model is trained to predict one of these class labels. The softmax output is typically used for this task as it returns probabilities that are more easily understandable (among other reasons). A very hacky and often inaccurate method to turning a multi-class classification model into a multi-label classifier is to compute the probabilities for every label and then take all predictions that have some threshold T% or higher probability. This method doesn’t work well as our network wasn’t trained end-to-end to jointly learn multiple labels. Again, give the post another read or two to help clear up your concept question. Sorry, I’m not sure what you are referring to. If you’re having trouble with the command line arguments before sure to refer to this post. Very interesting article! Would it be possible to train objects with a corresponding value in percentage as label? Could you elaborate a bit more on your question? Are you asking if we could use a real-valued output from the model? The answer is yes, we can, but that would involve training the model to perform regression rather than classification. I know how to extract real valued output instead of classes from the final network but I was wondering whether it would work for training too. Simply example, if you have 10 binary images would it be possible to use the percentage of white pixels for training? What do you mean by “use the percentage of white pixels for training”? Your previous questions seemed to be based on classification but now it appears you are talking about segmentation? Do you know of any way to do the reverse of this? As in: You don’t have multiple labels, but rather multiple photos. For example: you have 4 photos of an object, each from a different perspective, but all 4 photos belong to the same label (f.e. Vans Shoe #12. Same shoe, but several photos of it from different angels). And then evaluate a photo of a shoe and match it against every label, with the labels having multiple photos to match it against. That would be really great blog post. I’ve been trying to do this for a few weeks now and I just can’t get anywhere with it. This sounds more like an image search engine/content-based image retrieval. I don’t have any public-facing tutorials on this but I demonstrate how to build such a system inside the PyImageSearch Gurus course. There are ~60 lessons on feature extraction, machine learning, and image search engines in the course — be sure to take a look as your exact case is covered where we have four images in a database and given a query image of one we are looking to find the other three. I have been tempted a few times to purchase the instant access, but I’m worried that my skills in machine learning aren’t up to par to get the full benefit of the courses. I’ll definitely go ask my boss to get the instant access once I think I am ready to deliver on such an investment, though! The Gurus course doesn’t assume any previous ML knowledge. It can certainly be helpful but it’s not a requirement. The fact that you are following this blog and that you are asking such questions shows me that you would be ready for the Gurus course. Don’t let the lack of ML experience hold you back. 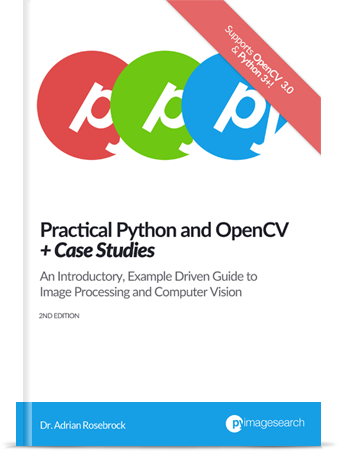 100’s of other members have started the course knowing only Python, no prior OpenCV or ML/DL experience — they have successfully worked through the course and I’m sure you would be able to (and I’m always around to help as well). Thank you, Anirban. Your comment really made my day and put a smile on my face 🙂 I’m so happy to hear you are enjoying the blogs, books, and courses. It’s my pleasure to write and create such content and each day I feel lucky and privileged to do so. can you please provide this code for real time detection in raspberry pi? It’s okay if you are new to the field but I would recommend investing in your skills a bit before trying to take on more advanced projects. 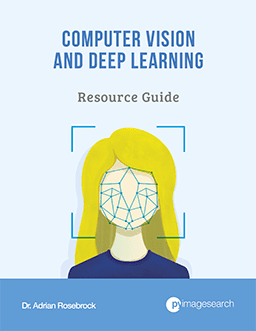 It may be challenging to learn a new skill but if you intend on working on more computer vision or deep learning projects I would highly suggest taking a look at Deep Learning for Computer Vision with Python where I discuss DL and CV in detail (the book will certainly help you get up to speed and well past the “beginner” stag). Just a suggestion for the future and I wish you the very best of luck with the project! Potentially, but that really depends on the data and the distribution of classes in the dataset. I would also be careful with your terminology here. A label belongs to a class and the terms are typically used interchangeably. It might be better to refer to “sub-classes” and “parent classes”. The unknown combinations is problematic but will likely be more accurate and more efficient once you have enough training data. My hybrid recommendation approach would be to train the network on single classes, have it reach reasonable accuracy, then perform transfer learning via feature extraction for any other more complex tasks. I would still recommend the multi-label approach and gathering more data though. I am trying to solve a multi-label classification problem where in I have an image and inside that image I have 3 different images (passport, DL, SSN). When I pass in that single image to the model then it should return me the all the classes present in that single image. Could you please share some link or thoughts on how to build a multi label model for the same. I wouldn’t recommend taking a classification approach. Instead, treat it like an object detection problem. You would train an object detector capable of detecting the passport, drivers license, and social security card. Based on the output of the detector you can determine which is present in the input image. Hi Adrian, another usefull post! I want to know if it is possible to Single Shot Detector (SSD) to output “object pose estimation” too? The current implementation of SSD only output the prediction of class and its bounding box. No, your network would need to be trained to perform pose estimation as well. There are papers that discuss how to do this but you cannot take a network trained for object detection and have it output pose estimation as well unless the model was also trained to perform pose estimation. Great post, Adrian. There are instances where I have images having more than two labels, like for instance, blue shirt black jeans where I have a collection of images belonging to the folder “blue shirt black jeans”. I need to split the labels into four and append it to the list. How am I supposed to modify the code in the train.py and classify.py scripts to split the labels? Exactly how you need to update the code depends on your directory structure but you should take a close look at Lines 11 and 12 followed by the Python shell output were I demonstrate how to parse out the labels. Do not try to train your network until you are 100% positive you are parsing your labels correctly. Hello Adrian, great post ! I would argue that in this case of multi label classification, you would need to use 2 softmaxes (one on shirt/dress/jeans and one on red/blue/black) instead of 6 sigmoids, as there are really 2 classifications going on here. 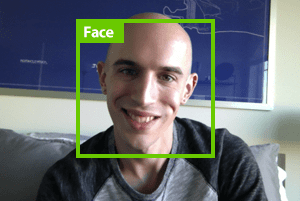 I have done that for an age + gender classification from face pictures and it worked well (it’s a little bit trickier to configure in Keras). Again congrats on the very clear explanations. Just to clarify, are you referring to two parallel FC layers that both receive the same input from the previous layer? The interest of this is, in my view, that it combines two classification problems into one network. The two parallel softmaxes “force” a selection of the garment type one one side and of the color on the other side. Got it, I understand now. What you are referring to is called “multi-output”, not to be confused with “multi-class” or “multi-label”. A multi-output network can actually combine both “multi-class” (via a softmax classifier) and “multi-label” (via the sigmoid method used in this post). I’m actually planning on covering multi-output networks in a future blog post but I’m going to move it up in the schedule as I agree with you, there would be a lot of interest in this and I would love to cover it. If you are new to command line arguments, that’s okay, but make sure you read up on them first. Once you have an understanding of command line arguments you can solve the problem. Excellent article. I have been following these posts for some time now as i skill up in deep learning and find these hands on examples an excellent way to learn/comprehend. Did have a question. I tailored your example to model on 2 classes and using a slight variation (sparse_categorical_crossentropy) as i was getting errors when using categorical_crossentropy. Is this a suitable approach? Secondly, if I were to train on a large dataset (i.e. 10-15k images+) is there a way to batch process loading into main memory (line 53) vs sequential to avoid out of memory errors? 1. If you’re only using two classes for classification you should be using binary cross-entropy, not categorical cross-entropy. We use binary cross-entropy for 2 classes and categorical cross-entropy for more than two classes. 2. You mentioned tailoring this example to your own needs but if you’re using categorical cross-entropy + a softmax classifier I think you may be defeating the purpose of this tutorial. In this guide we are learning to perform multi-label classification where our network can return multiple predictions from a single FC layer. To accomplish this, we need a sigmoid activation + binary cross-entropy as our loss. 3. You can absolutely work with large datasets. Since you already own a copy of Deep Learning for Computer Vision with Python make sure you refer to the “Working with HDF5” chapter in the Practitioner Bundle where I show you how to (1) serialize an image dataset to HDf5 and (2) write a custom generator to yield batches of data from the HDF5 dataset on disk. Using this approach you can scale your training algorithm to work with gigabytes/terabytes of data. I have an open source project on Github which may be able to use this functionality but I’m wondering if I’m allowed to include parts of this code (in their original and/or modified forms) in a public repository (assuming I give credit to you including a link to this page in the comments and/or readme)? Sure, feel free to use the code. I kindly ask that you give credit and include a link back to the PyImageSearch site in the README. If you can do that I would really appreciate it 🙂 Having a link back really helps me out. Thank you! Done with most of your tutorials. I am doing one of the project where I want to detect person only with own custom only..
Then detect the facial expressions of that person is he (happy,angry,sad,neutral,surprise) as u had done face recognition . And do body dynamics of detected person,for if is having some gun or some bomb in his clothes.. This all can help us in mall for getting theifs or in airpot. Can u help me how will be body dynamic or to detect inner part of clothes,if he has something wrong inside his body..
Will it be helpful if you do this for us. Or help me little bit .to get me in track. Human activity recognition and pose estimation are still an open area of research. It’s far from perfect but we’re making good strides. I would suggest starting with something like OpenPose. That would help you obtain the “joints” for the human body. From there you might want to run a temporal analysis on how those points change over time. You might be able to find some sort of suspicious behavior. Otherwise, keep in mind that CV and DL algorithms are not magic. If we cannot “see” the object (gun, bomb, etc.) in the image/video then our CV algorithms won’t either. I don’t have any tutorials on activity recognition at the moment but I will certainly consider it for the future. Can you share the full stacktrace of the error? Which script is generating the error? Hello Adrian! I Great tutorial for beginners who want to get started with a concrete case of multi_label classification. 2/Why chose assemble images in groups where each group represents a pair (color,dressing) ‘where color and dressing can take certain values ‘ ? Can’t we just regroup images by colors and dressing independently ? I mean instead of having folders regrouped by pair (color, dressing) , just construct folders regrouped by attribute ( where attribute can be either color or dressing) ? I am asking you this question because I am working on a case where I have 36 labels ( 2 for gender , 15 for clothes, 19 for color) : So i did not construct folders by triplet (gender,clothes,color , i just constructed my folders by attribute ( where attribute can be either the gender , the cloth or the color. Again, thank you for this tutorial, may be very useful to many since you are introducing many useful notions ( how to build the dataset of images, image augmentation, pre-processing data). 1. I think this really depends on how your accuracy measure is implemented. If it’s a naive accuracy measure as the one you mentioned, yes, that would be a problem. However, I believe the Keras implementation is actually looking deeper than that and looking for the entire vector to be classified vector. Perhaps my understanding there is wrong but we would need to consult the Keras code as I don’t think this specific use case is covered in the documentation. I would encourage you to take a look! Dive in. Research. Discover. That’s the best way to learn. In either case you can leave out the accuracy measure, swap in a different measure, or implement your own. All are possible using Keras. 2. How you decide you build your dataset directory structure is entirely up to you. I used a simple directory structure here as that is all that is required for the project. It allows us to focus on the code and techniques for multi-label classification rather than dataset directory structure which is an entirely different subject. To be honest, if you wanted more than two labels you should be storing the image filename + labels in a CSV or JSON file. I will leave that for readers to implement. I am sure that your understanding of the accuracy is right. If the number of class is large, the default accuracy in Keras is misleading. In this blog, the number of class is 5, therefore it seems fine to use the accuracy metric. Amazing article! But any hint how get both test accuracy and validation accuracy for each epoch? Thanks! Take a look at my reply to “Kangyue”. The gist is that you would take part of your training data and do another “train_test_split” on it to generate your validation data. If you’re interested in learning more about the fundamentals of machine learning/deep learning, including data split best practices and training your own neural networks, be sure to refer to Deep Learning for Computer Vision with Python. Hi there, it’s very clear that you split 80% data for training, 20% data for testing, any chance you would like to think split some data for validation? Thanks. You could certainly do a validation split as well. I would recommend doing an 80/20 split to obtain your training data and testing data, then take 10-15% of your split training data for validation. One question, how can we evaluate the accuracy / specificity etc for the multi-label setup. For example I have 14 label and each (training and test) image will have exactly 3 labels (plus some structure of which labels can come together and which can not etc). Now I wish to evaluate my system using different matrices… Some guidance please. I’m not sure what you mean by evaluating using different matrices. Are you referring to your vectors of class labels? The “accuracy” metric in Keras will help you determine the accuracy. In fact, the accuracy is already computed using the method proposed in this blog post. In that case I would recommend looping over each of your testing images individually, computing the labels, and comparing them to the ground-truth. You would compare each and every entry in the vector to determine if they match or differ. If it’s not identical you can increment your “incorrect” counter. That makes sense. Now, I have another question, instead of test the image one by one, is there any that you have a test data array and do the test according to this whole data set? Yes. You build a batch of images by stacking them together via NumPy. I don’t have an example of this on the PyImageSearch blog (yet) but I do cover it in detail inside Deep Learning for Computer Vision with Python. I really interesting with your explaination about this tutorial. My first question is I still think what the different VGGnet with Smallvggnet as long i read your explain in tutorial still same start with preprosessing, use relu and softmax too. On my oppinion maybe I use smallvggnet because I cant use VGGnet with my own computer equipment? or something else we not a big dataset? or other I still not have an answer. My second question is how to make all label predict as our output? My third question is can this tutorial not only use image? Can make a real time video? 1. Exactly which architecture you should use depends on your image dataset and the problem you are trying to solve. How to choose an architecture and optimizer is covered in side Deep Learning for Computer Vision with Python. 2. Yes, the model.predict() function will return probabilities for every class label. 3. Yes, you can use video as well. I would suggest using this post to help you get started. Hi Andrian, I think a “two headed” model is more proper to this kind of multi-label classification, and I implemented it in pytorch (I am not familiar with keras), I added two head to the top of a pretrained resnet-18 by replacing it’s fully connected layer, one head for classifying color and another for classifying the cloth type, and at last I got an accuracy of 0.99 . Hey Charles — what you are referring to is actually called “multi-output” classification. Each of the fully-connected heads can be used for either single label or multi-label classification. I’ll be discussing how to implement this method in a future blog post releasing soon. What about whenever you have different large datasets? – dataset2 contains information about types. How would you train this? You could train N separate networks, one for each dataset, or one network with N fully-connected heads, one for each of the datasets. The problem with the latter approach is that your datasets may not not be entirely relevant and in that case a single network approach would fail to learn high accuracy discerning patterns. Are you going to cover transfer learning in medical imaging? It seems that transfer learning from ImageNet models don’t work nearly as well on medical imaging data because the medical images have so little in common with photographs. I would consider it but I would need suggestions on which medical image dataset readers would like me to cover. Thanks for the reply. Do think about it because AI in medical imaging is a hot topic and not many bloggers teach how to do transfer learning on medical imaging. If you write a book to cover the application of deep learning to medical imaging I will definitely buy it!! Medical imaging is such an interesting topic but one of the problems is having enough “interesting” datasets to use that are also publicly available for others to access and work with. I’m always looking for recommendations on public use medical image datasets so if you have any recommendations let me know. Do you have a chest X-ray dataset that you are working with? Great tutorial as always, thanks a lot. I think you may be confusing accuracy, loss, and our objective function we are minimizing. See my reply to “Lorenzo” on May 7, 2018. Hi Adrian, thanks a lot for this. Stupid question: why do the probabilities of Dress + Jeans does not sum to 1? See my reply to your comment (June 5, 2018 at 8:23 am). How come the probabilities for Dress and Shirt sum to over 100% in the first example? Keep in mind that these are treated as two independent labels — that is the entire point of this tutorial. Since we are using a sigmoid activation with binary cross-entropy our single fully-connected layer can predict multiple labels. I wanted to know about the “fashion.model” file. How do I build this file for my own dataset with different set of images all together ? The fashion.model file is our serialized Keras model. If you would like to build your own dataset be sure to refer to this blog post. Why not two outputs both with softmax activation functions? Since you know that your classes are disjoint (there cannot be jeans and dress) this would probably work better than a general sigmoid function. Background: Your code is set to display the images in a new “Window”. However, I am on a system which does not support a GUI. Hence I had to change it to display the images inside a Jupyter Notebook. I did this by using “import matplotlib.pyplot as plt” and then using the imshow() function of plt. The unusual: If I use your default code settings (specifically use the cv2.imread() function), the images come out to be blue-ish. Always. The predictions make sense though. However, I can see the picture properly if I use imageio’s imread(), but the machine sees and predicts something else. Any idea why this behavior happens? Here’s the link where I have uploaded the two images. They have been generated using the same code, the only difference being change in the imread() function. Correct output has cv2.imread() and incorrect output has imageio.imread(). It’s actually not unusual once you understand what’s going on under the hood. The cv2.imread function returns images in BGR order but matplotib expects them in RGB order. See this blog post for more information. First of all, thank you so much for your amazing tutorials! 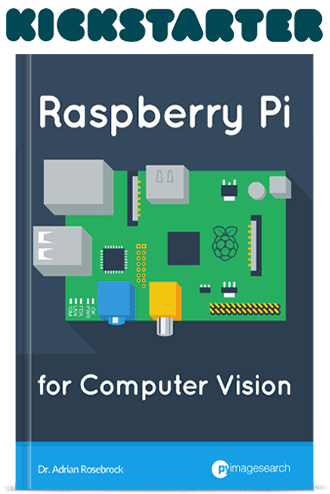 They are great for anyone trying to learn machine/Deep learning and even OpenCV. I need to classify attributes in a face like colour of eye, hair, skin; facial hair, lighting and so on. Each has few sub-categories in it. So should I directly apply sigmoid on all the labels or separately apply softmax on each subcategory like hair/eye colour etc? Which one will be better in this case? Or should I combine both as some subclasses are binary? So I should choose binary cross entropy for binary-class classification and categorical-cross entropy for multi-class classification? And combine them together afterwards in the same model? Moreover, should I approach this a multi-output problem or a multi-label classification problem? I have read your similiar tutorial done using dlib and opencv, but I am using CNNs for it. The short answer is that you’ll need to evaluate and run experiments to determine your best course of action. Hi. Thank you for the tutorial. I encountered a problem in the output when i tried to get an image from the internet and use it for testing . The examples work out just fine but when the image comes from google. Those lines are displayed in the prompt. I’m new to deep learning so i really don’t understand yet. Both of these books will help you quickly and efficiently get up to speed. – What is the maximum number of classes we can learn using this network? – How many number of samples per class should we have at least? – and would you introduce any references to understand how “finalAct = sigmoid” will enable us to perform multi-label classification? 1. There isn’t a real “maximum”. You would just need to modify your network architecture to accept more classes and likely deepen it as the classes become more complex. 2. I recommend 250-1,000 for simple NNs. You should try to get higher than 1,000 for more deeper NNs and more complex. 3. Re-read the post. I discuss why the sigmoid activation function is used. I would also suggest you read through Deep Learning for Computer Vision with Python to help you get up to speed with deep learning. The book covers both fundamentals and advanced topics, ensuring you can effectively apply deep learning to your projects. I am kind of confused about the metric ‘accuracy’. For single-label, accuracy can be easy to understand, the number of data points that are being correctly predicted among the whole data points. But for multi-label classification, how to define correctly predicted? For example in your case, do both the output two labels(e.g. blue & dress) need to be same as the ground truth two labels(e.g. blue & dress)? Or the most possible label(e.g. blue) is the same as one of the ground truth labels( e.g. blue & dress)? Both predicted labels should match the two ground-truth labels. It is a great work with a lot of details. Thanks for your sharing! I found the problem and I fixed it but now I’ve got another error. and now I have ” MemoryError ”. The code used in this post assumes that you can fit your entire image dataset into RAM. Your image dataset is too large to fit into RAM. I discuss techniques to create custom data generators that scale to terabytes of images inside Deep Learning for Computer Vision with Python — I suggest you start there. Hi Adrian, I want to run the code in the server with 4 P40 GPUs (OS: CentOS7) because it is hard to run it in my local computer (Windows7). However I have a problem, you know for the safety reasons server can’t connect to Internet so I have to install Keras offline. And do you have any good idea to handle this tough problem for I tried to install .whl one by one but it seemed useless, meanwhile there’s a strange phenomenon that keras_preprocessing.whl and keras_application.whl rely on each other.Thanks! Hey Enjia — can you physically access the machine? Or can you connect to it through a local intranet? If so, clone down all the repositories you need, move them to a thumb drive (or connect via intranet), copy the files to the server, and then install from source. The fashion.model file is a binary HDF5 file generated by Keras. It includes the model architecture and the weights for each layer. It is not meant to be human readable and it’s only mean to be read and interpreted by the Keras library. What will be the maP and the all that stuff for the given network. How to calculate it. Can you give a tutorial on that, not really properly understanding the concept. Every trained netowrk architecture I see gives those parameters. Hey Drhuv, I cannot guarantee I will have an entire tutorial dedicated to mAP but I will consider it for the future. I went ahead and implemented your network into google colab. Could you provide a more detailed guide for this especially for networks like VGG, GoolgeNet, AlexNet. You could maybe refine the tedious approach of mine of training in GoogleColab. Hi Drhuv — I actually provided super detailed guides for VGG, GoogLeNet, AlexNet, SqueezeNet, ResNet and many more inside Deep Learning for Computer Vision with Python. That would be by far my recommended starting point for you. Ok thanks. In process of saving to buy pyimageserch btw. Sounds great, Dhruv 🙂 I promise that it is an excellent investment of both your time and finances. Always feel free to reach out if you have any questions. I tried to personalize it by training a simple model to recognize triangles, squares, and circles in a picture. I only had to change the dataset by downloading pictures from kaggle. The model that I trained is not accurate at all. It only detects triangle and only says 100%. I was windering if I also had to change mlb.pickle. Is there a particular reason you’re using multi-label classification here? A shape should be only one type: a triangle, square, or etc. A square cannot be a triangle, so again, I’m a bit confused why you are using multi-label classification. Thanks a lot for the tutorial. Its helping me a lot 🙂 . I tried to implement the same with a different dataset which is similar but the image sizes are less.Most of them are between 10k to 30k. I can see that images are loaded but there is some prob while resizing. Double-check your path to the input directory of images. It sounds like a path is invalid and then “cv2.imread” is returning None. I had the same issue a while ago.. Once double check the image data. add print (“[INFO] Image Name : ” + imagePath) line just after image = cv2.imread(imagepath). you can know which of the image file is corrupted or the filename is not correct.. also the file names must be in decimal number format. I have a small confusion while training thee model. I can see that you have around 2000 images as total. now you are splitting in into 80:20 ratio for training and validation respectively. so according to this data ~1600 images for training and ~400 images for validation. so the STEP PER EPOCH = 1600. but I can see while training it is been trained on just 57 images. May I know the reason. I tried with my own dataset (9000) images with 9 classes. here while training, the STEP PER EPOCH is only 257. I am confused on how is it splitting the images for training and validation..
Where are you seeing your steps per epoch value? I am sorry. I missed that you are dividing the step per epoch by batch size. Could you explain me why you are dividing the step per epoch by the batch size. I mean what’s the difference if I take the step per epoch as total no. of training data instead of dividing it by batch size. Is it making the training more robust. if so then could you please explain me how? It has nothing to do with accuracy or making the model robust. It has everything to do with the training procedure itself. The .fit_generator function does not know how many steps there are per epoch since it will generate date infinitely. Instead, we tell it how many steps there are by dividing the total number of images by the number of epochs, resulting in the steps per epoch. If you need further help understanding the fundamentals of deep learning and training procedures (including my best practices, tips, and tricks), I would recommend you read through Deep Learning for Computer Vision with Python. A great tutorial with excellent algorithm and implementation (code) explanation. But a small hiccup , please refer to train.py code explanation you have refereed to code lines 53 to 61, but no such line no’s in the block above the explanation, I think some how the line numbers are re-numbered to 1 to 12 . The code is still understandable anyway, except for some very newbies like me. I appreciate your great effort in making most complicated concepts of DL and CV, understandable to a beginner. Really an excellent article, just a question what the figure 54 when doing the training network and thank you in advance. It’s really a nice tutorial and I followed it up and created my model for clothes classifications. But I’m facing a serious problem with this approach is, I’m training around 19 GB of data with this that is taking infinite time and memory to train, I’m trying to change the approach in this model with custom generator but I’m not succeed, It will be a great help if you can really post an approach with custom generator for train.py file. what is the filter name used in this network ?? Hey Sara, the filters are automatically learned by the CNN. There is no “pre-defined” kernel such as Scharr, Sobel, Prewitt, etc. Thank you for the code provided.When I use code to load big data, there is not enough memory. So I tried to load the data in bulk. However, I am confused because the category data changes with the loaded data. Do you have any suggestions for improvement? How much data are you working with? 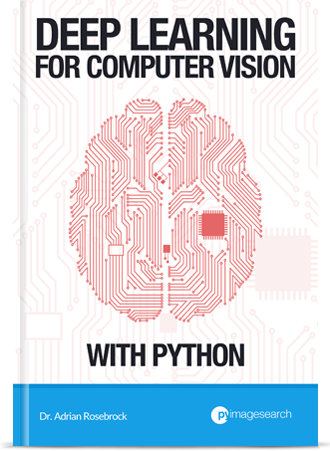 Inside my book, Deep Learning for Computer Vision with Python I discuss how to train networks datasets too large to fit into memory (in the order of terabytes of data). Check it out as I believe it will help you solve your problem/project. Thanks for the tutorial, Just a small doubt. How does binary cross entropy function work in the multilabel problem? Does it take the average or the sum of individual binary cross entropy? I’am getting this error.Please help. Also if I want to use some other dataset can I use this same code and only change the path to my required dataset? Make sure you use the “Downloads” section of this blog post to download the source code rather than copying and pasting. You likely accidentally introduced an error when copying and pasting the code. Make sure you are in the directory where you downloaded the source code. I want to use some other dataset can I use this same code and only change the path to my required dataset? Yes. Just make sure you dataset has the same directory structure as mine. I don’t have the .model and .pickle file for my dataset.How do I work around that.? Those files are automatically created for you when you train your model. The path to your input image is incorrect. Double-check it and then read this tutorial on NoneType errors. I am performing the multi-labelling classification but I do not know that how can I make labbeling for it. I have 10 labels for 3000 images. Can you share any idea me how I can make Multi-hot encoding? The MultiLabelBinarizer class performs multi-label encoding for you. I would suggest taking a look at it (we use it in this tutorial). Thank you for nice guidance. can you suggest me some feed forward neural network, that can work as a multi labelling? Nearly any CNN can work for multi-label classification, it just requires updating the final fully-connected layer at the end of the network. Hi Adrian, this was an amazing tutorial, but how would you handle mutually exclusive type for example a dress that is red and black? I see you were asking about a medical data set for imaging kaggle has a contest about image cell classification. It’s quite complex classification. You could still use same approach, you would just need to encode your training label vector such as that the “red” and “dress” labels are activated in the one-hot encoding. Is there any tutorial on multiclass image classification? This tutorial covers multi-class classification. Perhaps you mean multi-output classification? Could you be a bit more specific regarding what you are trying to accomplish? If you have the computational resources, why not just train two models on the same dataset? One for clothing and one for color. Wouldn’t that have a better chance of requiring a sample of every combination of clothing/color? Besides computation time, is there any real disadvantage to having two models? It really is dependent on your problem and whether the two may correlate. I think you’re focusing too strictly on the example of clothing classification. That may not be the case for other datasets. If you have the computational resources it may may sense but you would run experiments to validate that — let your empirical results guide you. any change we can draw a box on the predicted image ? for example incase we have 2 items in the same image ? This tutorial covers image classification — you are trying to perform object detection. For the above example, may I know which bundle of your book covers? You can see which topics are covered in which bundles on the official Deep Learning for Computer Vision with Python page. Let me know if you have any questions on it. can I use this classification to shape detection through image classification? Potentially yes but without seeing what your image dataset is it’s hard to know if that would work. Give it a try though! can we work in real time ? Yes, the model covered here today can run in real-time, even on a CPU. Thank You ! It Work 80%..
How to rectify this error on running train.py? There isn’t a file named “annotations.pickle” in this project so I’m not sure what you’re referring to. Could you clarify? It is simply great tutorial, I just want to ask about the accuracy metric, Is it binary accuracy or categorial accuracy? And is it better to consider F1 score for multi-labels classification task. can we use tabular dataset(csv files) in multi label classification in real time?? Yes, that is absolutely possible. However without knowing what your CSV file contains or what the goal of the project is I can’t provide you with any other suggestions. if i want to make simple cat dog multilabel classifier only changes with softmax to signoid with 2 dense layer and taking the loss function binary , so the classifier will able to predict both cat and dog at a time if i will give input image where cat and dog both are presented. In that case I would actually recommend object detection instead. I have a project which is 75% related to your blog post. I have learned a lot and currently I’m trying to implement a full-fledged project. Thanks Lamin, I’m glad the tutorial was able to help you!